A few thousand for a 280,000-mile Ford Focus? Obviously, we can't pass on that. Some vehicles are ideal choices for conversion into post-apocalyptic art cars. The Ford Bronco, Toyota Previa, or even AMC Eagle are all understandable picks. 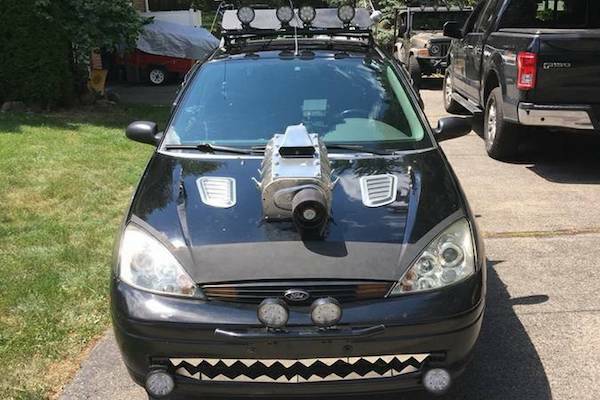 One Michigan resident appears willing to raise their hand for the Ford Focus, and as proof of their faith in the Focus, has encrusted their Ford in as much military and post-apocalyptic paraphernalia as hot glue can hold together. Said car surfaced on craigslist in Ann Arbor, Michigan Saturday, demanding a price of $5,000. Immediately obvious is the longitudinally-mounted supercharger bolted to the hood, beneath which a transverse four-cylinder engine lies. 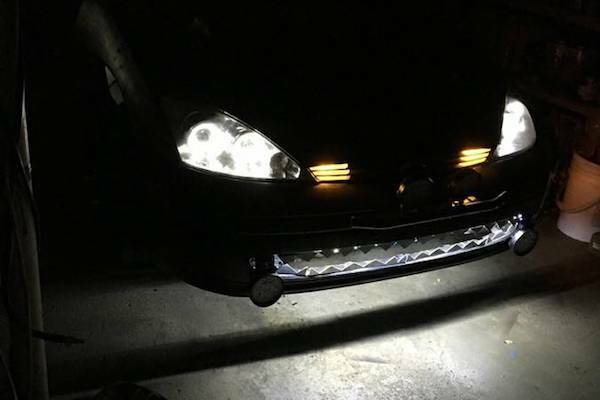 Fake vents, enough spotlights to make your average Jeep Wrangler owner swoon, and a toothy light-up grille complete this Focus's too-busy front end. Not visible are the siren and amber strobe lights, nor the entirely illegal red-and-blue flashing lights. "No mods," says the owner (likely a Tyler Rogoway wannabe) in the car's for-sale ad, obviously missing the spiked lug nuts that herald the arrival of a Tapout shirt. Up on the Focus's roof are a pair of fake surface-to-air missiles and a replica Browning M2 .50 caliber machine gun. We imagine neither are welcome at the owner's place of work, as the ad states that the car accumulated 240,000 miles commuting to the Detroit Metropolitan Airport—the car's owner confirmed to The Drive that they work at said airport, and indeed commute in a car loaded with fake weaponry. 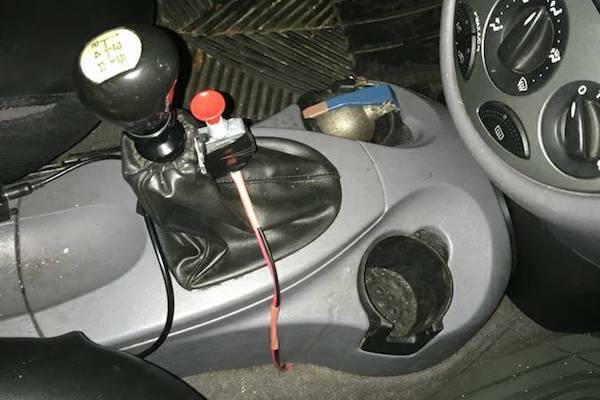 The fact that the car is already rolling red-and-blue bait is made worse by the grenade stored in the car's cupholder, as seen in the picture. One imagines that the (possibly numerous) traffic stops this car may have solicited could have resulted in multiple orders to keep hands where they can be seen, ideally, behind the owner's head. 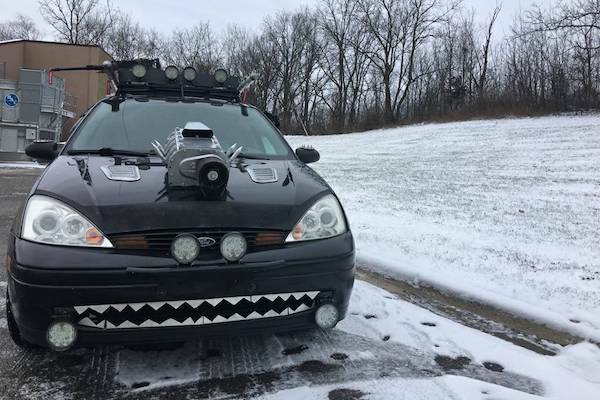 Possibly worst of all is the fully-functional propane flamethrower that projects flames through the car's rear license plate frame for up to four feet, making this Focus a true hot hatchback. "Works great for cooking marshmallows, or hot dogs for tailgating," says the owner in the car's ad, though it is unclear whether the owner means tailgating prior to a Detroit Lions game or for traffic. 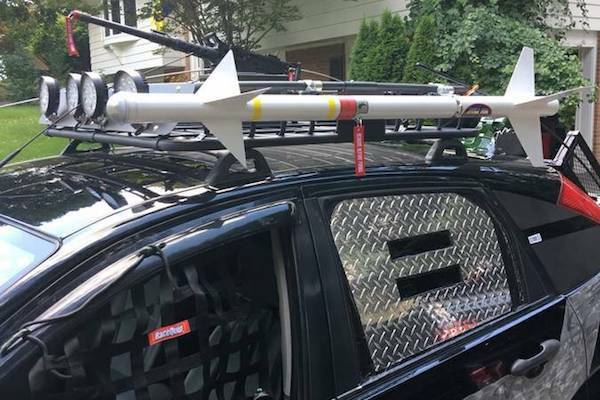 Strangely, the car's owner told The Drive that its plethora of weaponry both real and not has never gotten them pulled over. Dropping $5,000 will net you this ultra high-mileage Focus, which is claimed to still be on its original engine and transmission. It may be well-maintained underneath, but is a reliable car worth the risk of regular fix-it tickets? Your money, your call. "It's a lot of fun to drive... very addictive," the owner told The Drive in an email. "It's a blast to get smiles and laughs from it all the time." Stunt driver Terry Grant set a new world record for the fastest two-wheeled mile. 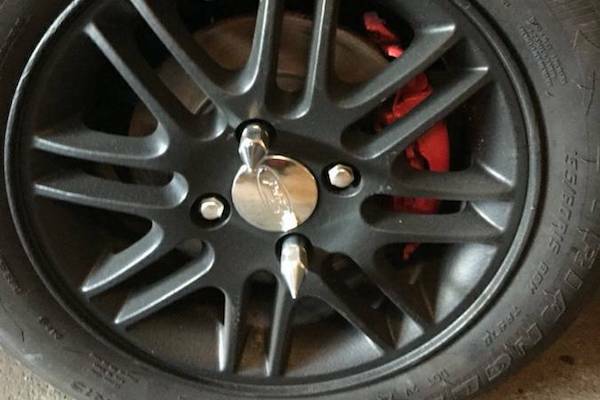 The most effective modification is something you can do to any car. Those looking to lease are eligible for a $4,000 discount. It's the most beautiful vision of rush-hour gridlock we've ever seen. McLaren's new long-tail supercar makes its world debut in a cloud of tire smoke.